Beginning Dec. 17, the Western Church marks the coming celebration of the Incarnation at Christmas with a series of antiphons at Vespers and the Alleluia Verses at daily Mass which each signal a different title for the coming Christ. The seven antiphons are: O Sapientia (Wisdom), O Adonai (Lord), O Radix Iesse (Root of Jesse), O Clavis David(Key of David), O Oriens (Eastern Dayspring), O Rex Gentium (King of the Nations), O Emmanuel (God is With us). You find allusions to these if you read the full lyrics of the seasonal hymn “O come, O come Emmanuel” which correspond to these literary titles for Christ, but out of order, as we are all most familiar with the last. It’s also a special week to me because the first of these days is the birthday both of my deceased paternal grandmother Helen (married to a Constantine strangely enough; theologically speaking that’s like having an Ozzie and Harriet or Kim and Kanye in the family), and also of Pope Francis. 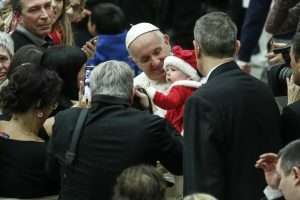 This year Pope Francis chose to spend this 82nd birthday celebrating with the sick children and medical staff of the Santa Marta Pediatric Dispensary. It’s important for Christians to remember that the celebration and joy of the holiday season, while real, is often in many ways tinged with melancholy, nostalgia, and for some, loneliness and stress. This is of course not unusual, as even the holly with which we deck the halls, ultimately represents the pointed thorns of the twisted crown and the drops of blood they brought forth in the Passion. Christ’s birth in the manger can never ultimately be dissociated from the ultimate exultation of the Cross. So too with us, our most precious memories and traditions are often somehow studded with the ineradicable longing and loss that form part of the human experience. We must remember that this “hap-happiest time of year” is blissful only in two ways: through the unsullied eyes of the innocence of childhood, and as foretastes of that irrevocable bliss when the divine will ultimately make all things new, in a final and permanent way. As C.S. Lewis puts it, “The fact that our heart yearns for something earth can‘t supply is proof that Heaven must be our home.” Advent is the liturgical expression of a longing that is intrinsic and fundamental to both religious and all human life. So it’s more than a merely kind gesture for Pope Francis to remember the seemingly staggering injustice of the suffering of children in this season of Christ’s birth and his own. It’s a profound theological statement, one which breaks open the inadequacy of all doctrinal statements and liturgical memorials, to move beyond these tactile but limited pointers to the ultimately incomprehensible mystery of transcendent, active and all-encompassing Love, in its purest and most inexhaustible expression — the co-sharing of divine life with that which is not God. In the weakest and most fragile, the suffering, the isolated, the separated, the “other,” we find the face of our Lord and the reason for awe and gladness once more.